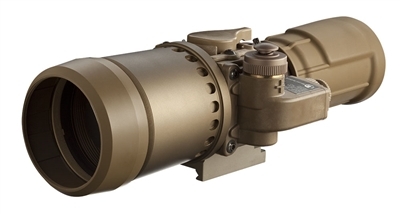 Based on the standard-issue AN/PVS-24 (M2124), the L-3 EOS CNVD-LR (Clip-On Night Vision Device – Long Range) converts an existing magnified day scope into a long range-capable night vision optic. The CNVD-LR attaches to M1913 Picatinny Rail in front of standard day scopes. Using a fast catadioptric lens, it gathers more light than its little brother, allowing it to provide crisp night vision images out to extended distances. The CNVD-LR can be easily attached and removed so the operator only needs to carry one weapon system for both day and night engagements. Clip-on sights offer other benefits such as allowing shooters to maintain established eye relief on their day scope and the ability to use it in front of a spotting scope as well. Available in green or white phosphor.